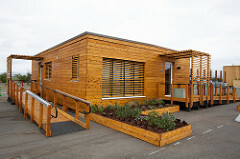 Norwich University’s Delta T-90 House placed 12th overall at the U.S. Department of Energy Solar Decathlon 2013. The team tied for first place in the Affordability Contest. Following Solar Decathlon 2013, the Delta T-90 House was transported to Frank Lloyd Wright’s Westcott House in Springfield, Ohio. There, it has taken on a new life as an experiential learning lab. Integrated into the Westcott House Foundation’s regular tour program, the house also serves as a catalyst for design education activities to foster dialogue about sustainable practices and environmental stewardship. The house was awarded a “Creative Economy” grant by the Ohio Arts Council, and received a “Museums for America” grant from the Institute of Museum and Library Services for its innovative approach to community engagement. Public tours: Visit the Wescott website or call the Westcott tour office at 937-327-9291.